It is placed at the top of all Ogranization also called as Organization. 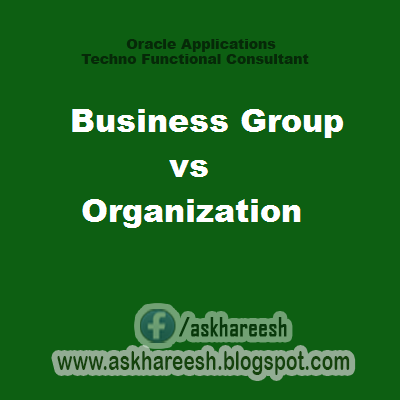 If the Organization contains the classification of Business group then it is called Business Group. KFF can be attached to BG. In BG we can generate employee number and Assignment number automatically or Manually. The Data will be store in HR_ALL_ORGANIZATION_UNITS , PER_BUSINESS_GROUPS. It is used to hold Definations of Organizations like Departments ,Regions and Divisions. It can be used to hold Business Group definations. It can assign the employee information to Business Group But we need to have valiu HR Organization classfication under BG. The Data will be store in HR_ALL_ORGANIZATION_UNITS.